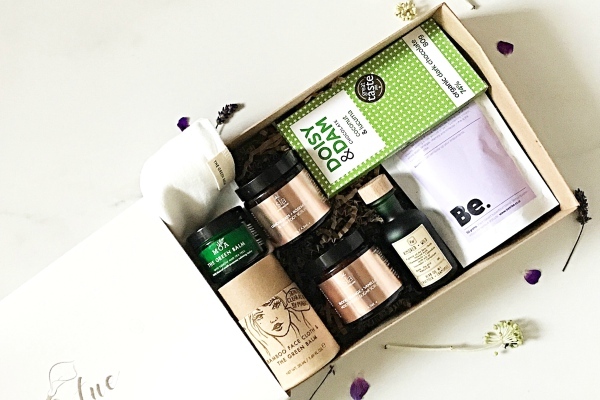 Who Needs to Go to the Spa if You Can Have a Vertue Box? Isn’t it lovely when someone else takes care of packing a nice goodie box for you full of healthy wellness-enhancing treats for you mind, body and soul? And who doesn’t like the anticipation of pleasant healthy surprises coming your way? I certainly do! And that’s exactly how I felt when I received my first Vertue Box – a clean, green, cruelty-free, veggie-friendly health & beauty subscription box, packed full of ethical and natural brands, and a business which donates 10% of its profits to charity. Most of these brands were new to me, but they have since become some of my favourite organic wellness products. It was a no brainer – I have right away created my own home Spa ritual using all of the products from the box. I would start with a nice hot bath; after soaking in it for a bit I would apply Isla Apothecary Blood Orange&Vanilla Sugar Scrub, and Lemongrass&Rosemary Renew Foot Scrub. Both scrubs have an absolutely divine scent, filling the room with the gentle aroma. They are very gentle on the skin, with soft and smooth texture. The anti-oxidant rich oils in the scrubs seep in and tone, cleanse, and seal moisture in the skin. They provide effective exfoliation paving the way for the oils to feed and initiate the rejuvenation of skin cells. Whilst the scrubs were doing their magic on my body, I would apply MOA Daily Cleansing Ritual to my face using a luxurious super-soft bamboo face cloth. This unique product contains organic yarrow, a herb renowned for its nourishing and healing properties. Combined with tea tree oil, nature’s powerful antiseptic, it creates an unrivalled healing synergy with endless therapeutic properties. The result – my skin felt not only deeply cleansed but extremely smooth, polished and soft. Having enjoyed my cleansing ritual, I would then nourish the skin with another goodie from the box – the Kindred + Wild Lavender and Chamomile Oil. Chosen for their amazing multitasking abilities and wide range of benefits, Lavender, Chamomile and Geranium oils are all round beneficial for skin to soothe, calm and balance. What’s also great that all the skincare products in the box have multiple uses – for example, the MOA product can also be used as a healing balm, whilst Kindred+Wild oil is not only great for moisturising but also for cleansing. After all the face&body indulging Spa procedures I would make myself a smoothie with a dash of Be Tribe Fix Up Superblend. It’s packed with antioxidants, vitamins and minerals, helping your body heal, fight toxins, feed cells and eliminate the bad stuff. Each blend also contains adaptogens, from root herbs to medicinal mushrooms – natural substances to increase the body’s own ability to reduce the damaging effects of stress. Finally, I would have a generous piece of Doisy and Dam Chocolate with coconut&lucuma. I literally had to hide it so that no one else in the house would touch my chocolate – it’s too good to share! It contains Cocoa Mass, Organic Cane Sugar, Cocoa Butter, Coconut Flakes, Lucuma, Coconut Essence and Vanilla Powder – a winning formula of a healthy dark chocolate in my mind!